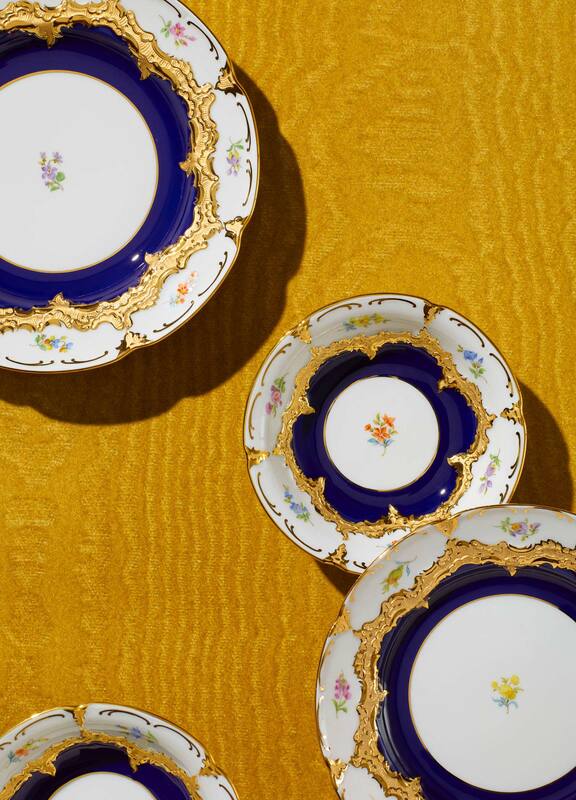 Created between 1844 and 1855, the "B-Form" service from Ernst August Leuteritz is a shining example of Meissen's historicism. Characteristic of this style is the liberal incorporation and even amalgamation of elements from preceding epochs, in particular from the Renaissance, Baroque, and Rococo periods. 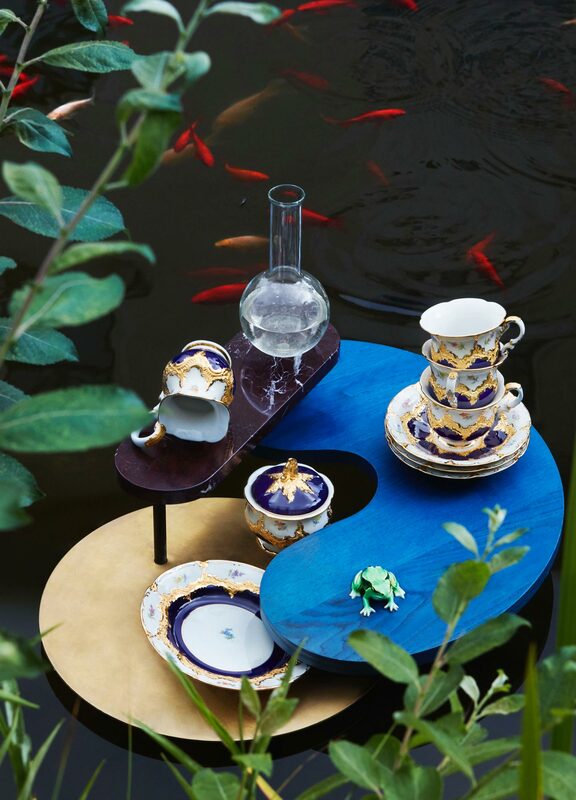 This masterpiece of European dining culture is nothing short of lavish, almost ostentatiously so, resplendent in royal blue, and elaborate reliefs in 23-karat gold coating. 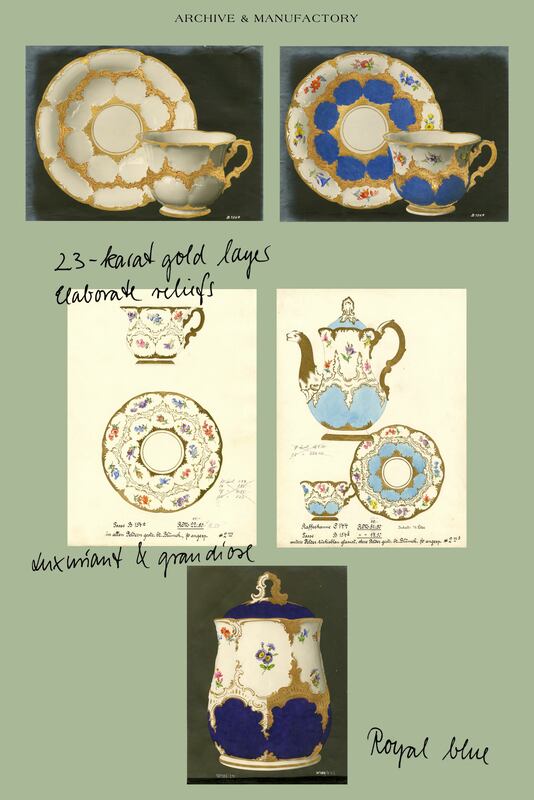 Such elegant porcelain, often entirely covered with painted adornments and gold, was keeping in line with the appetite of that era's well-to-do bourgeoisie for displaying their wealth and status. 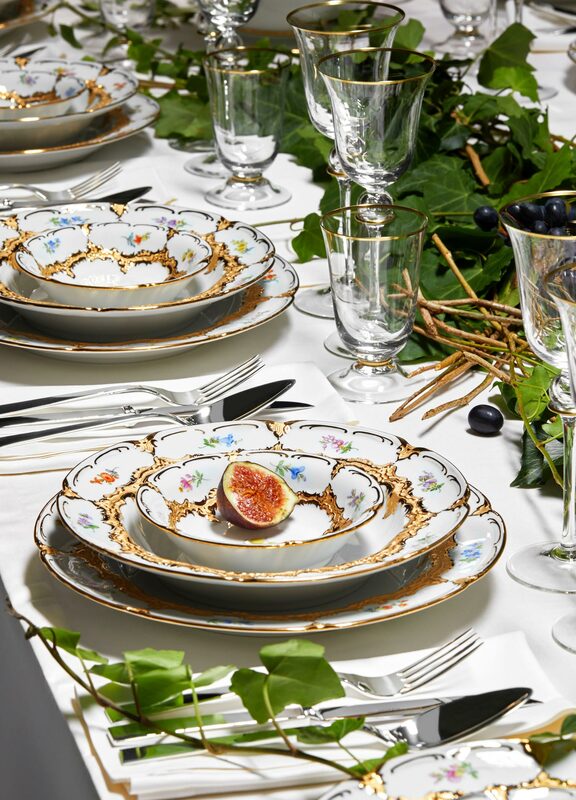 Presented at the International Exposition of 1867 in Paris, the "B-Form" service quickly became one of the Meissen manufactory's bestsellers. 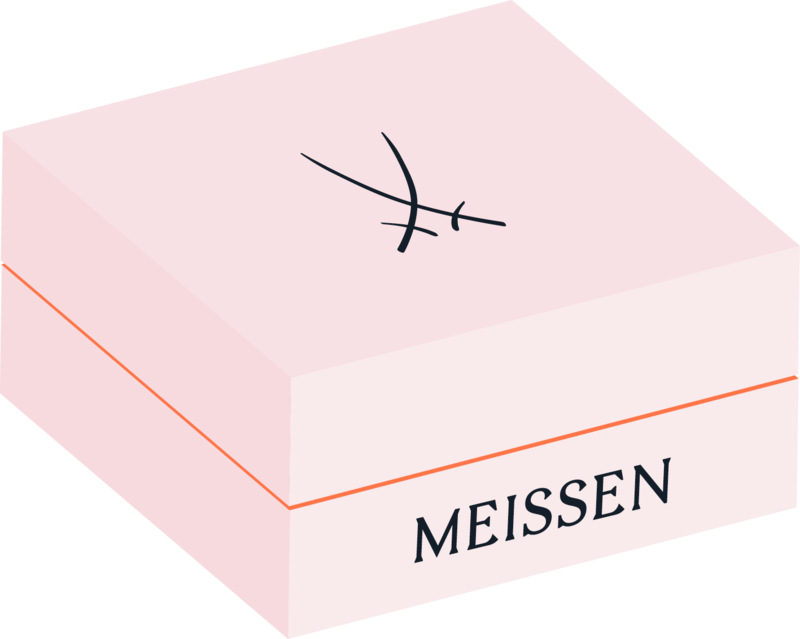 The name, on the other hand, has more pragmatic origins: The "B" was the code for the original mould number in the Meissen archives. The characteristic gold bronze reliefs of the "B-Form" service, created between 1844 –1855 by Ernst August Leuteritz, brought domestic luxury and coffee culture into the circles of the 19th century's aspiring bourgeoisie. Lush and luminous gleams the high-karat gold bronze as it drapes over the sumptuous reliefs, rims, and ornamentation of the "B-Form" service. To this day, this embellishment is still applied by hand onto the unglazed surface of each individual plate, cup, and saucier. During the third firing, the gold takes on its unique, semi-matte shimmer. 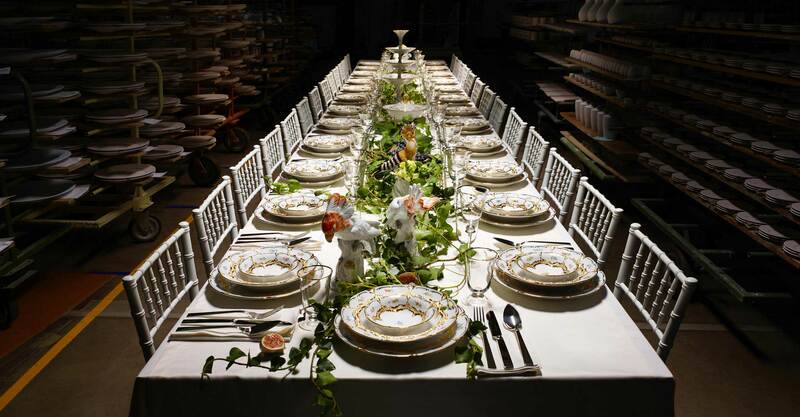 It is the harmonious interplay of the pure white porcelain with those channels of gold that lends this service its particular allure. 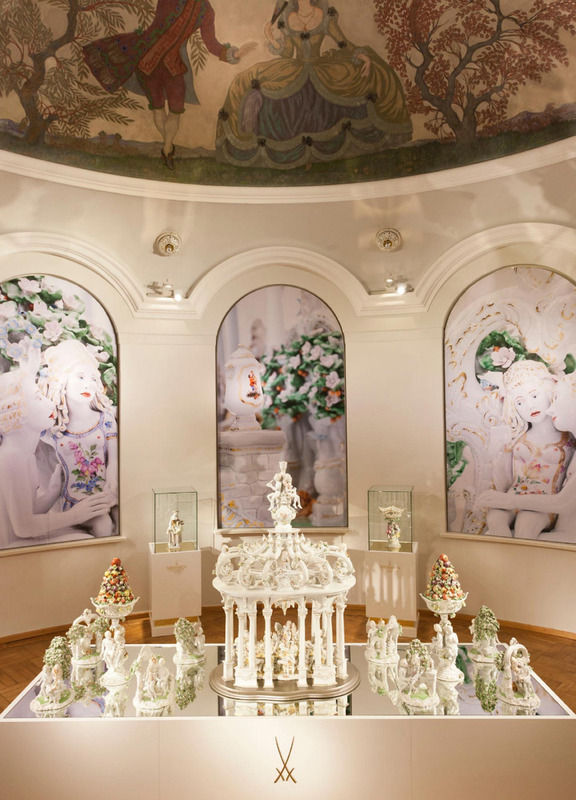 The "Strewn Flowers" are one of the most beloved decorative motifs of the Meissen manufactory. Created at the start of the 19th century, the design is typical of the Biedermeier era. The impetus was to feature the natural beauty of blossoms and flowers and thus pull away for the first time from archetypal East Asian designs, or "Flowers of the Indies". 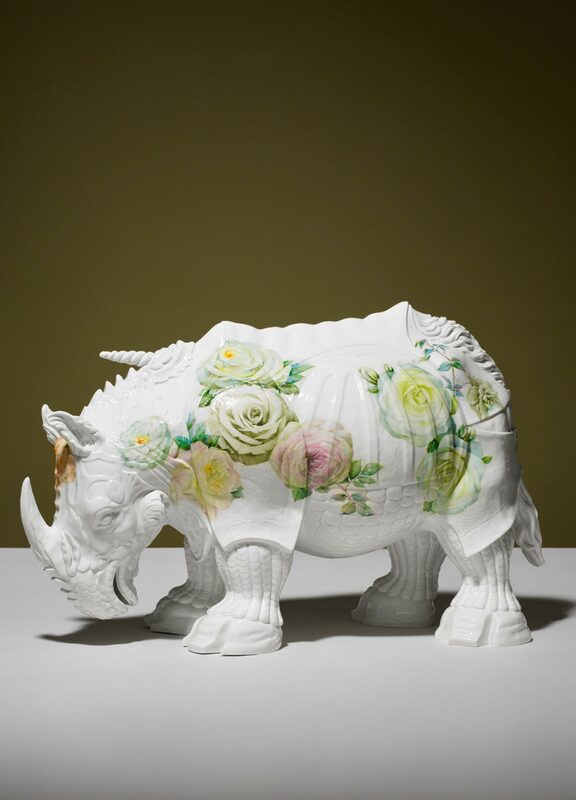 As a variant of the "German Flowers" painting style, this Meissen decor exhibits certain unique characteristics. Strewn around a larger central flower are a variety of smaller blossoms, which painters can select from amongst three dozen flower motifs. Each had its own symbolism during the Biedermeier era and was used to express thoughts and sentiments. 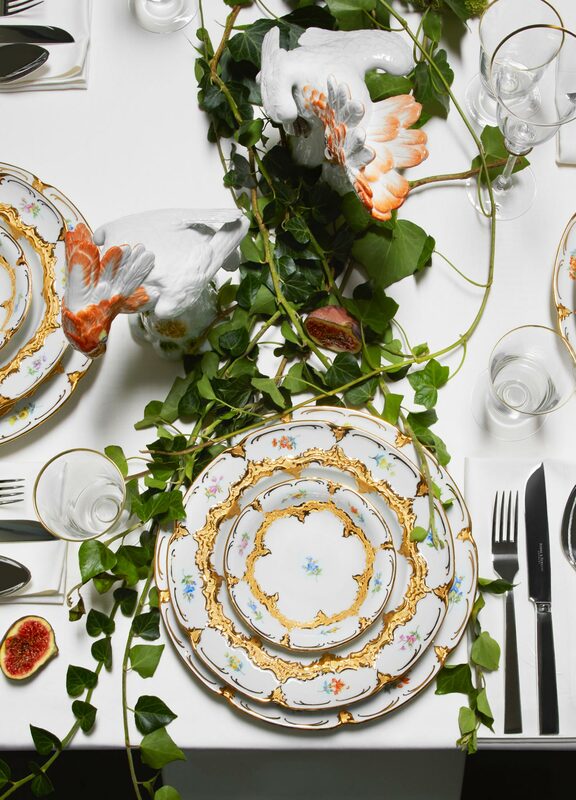 Painted on the porcelain by hand, the fine detail of the "Strewn Flowers" lends the "B-Form" service particular vitality and an innate symbolism. 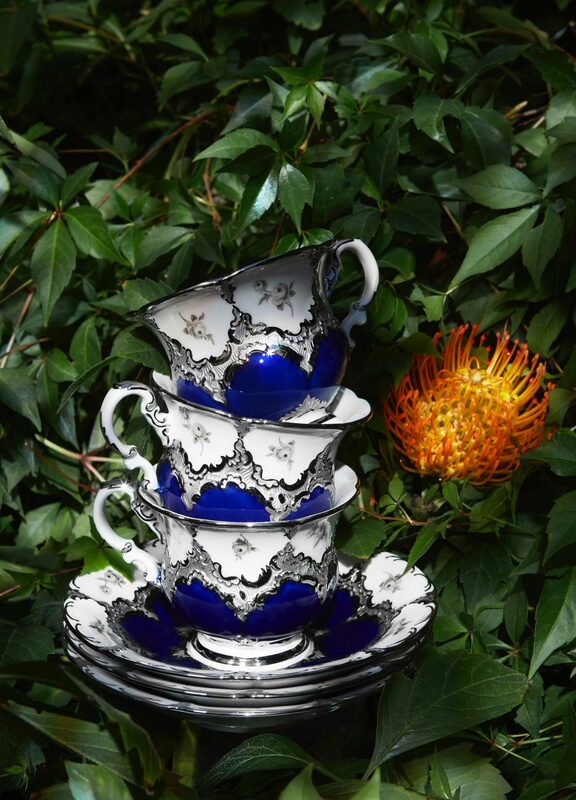 For what would have this year been Leuteritz’s 200th birthday, his successors have designed a new set that hits a more modern note of opulence – glazed royal blue with platinum and scattered roses in a sepia tone, this service set combines the splendour of banquets of the past precisely with a modern expression of lavishness. The platinum, used for the very first time on this set, lends an elegant and modern note to the classically ostentatious of the gold pieces. In combination with the sepia paintwork, the platinum boasts a more modest and somewhat reserved effect. The colour allows the motifs to shine in a brand-new light, merging historical heritage with a contemporary sensibility.